For some organizations, hiring occurs only with growth (new positions added) or attrition (people leaving their jobs). But with many markets, a seasonal workforce is do or die. It can mean the difference between survival and making millions. Retail, hospitality, non-profits, and others all experience this a little differently, but the pain and frustration can be the same. Hiring seasonally means you have a relatively small window to attract, interview, hire, onboard, and train a large workforce. From what I have noticed, organizations that hire seasonally tend to have lean HR departments. This can be because during the off-season there isn’t a need for a large HR department. It would get crowded. In preparation for the busy season, you would take help from the neighbor’s dog . . . if he were qualified to help out! So, how do you navigate the stress of seasonal hiring? Once you are ready to kick your hiring into high gear, you need to get the word out in a big way. Job fairs and casting calls can be helpful, but they are also time consuming, chaotic, and rely heavily on marketing the fair itself. Advertising for your jobs, especially to millennials, may be a better use of your time and resources. The rising generation look for jobs on search engines and social media more than previous generations by far. They search most often on their mobile devices. In fact, Indeed.com says that 73.4% off all millennials’ job searches come from mobile devices. Let’s back up a little bit. First you want to start by advertising your jobs on your company’s career site using an online application and give each job listing a unique URL. More on that here. Once you have the jobs listed, most hiring software companies gives you a chance to push the jobs out to job boards, aggregators, and social media. Here is a quick glimpse into how we advertise jobs for our clients. Higher retention rates: After one year, referred employees have better retention rates than those that come from career sites and job boards. Less time to fill: According to Zalp, it only takes an average of 29 days to fill a position when it is an employee referral vs. 45 days for a regular career site recruit. People share job openings: If statistics hold true and one employee shares a job opening on social media and only 15% of their friends share the post, you could have an expanded reach of 9650 average views per employee! That is the magic of social media. I know what you are thinking, but we are a non-profit. We don’t have extra cash to throw around to attract talent. 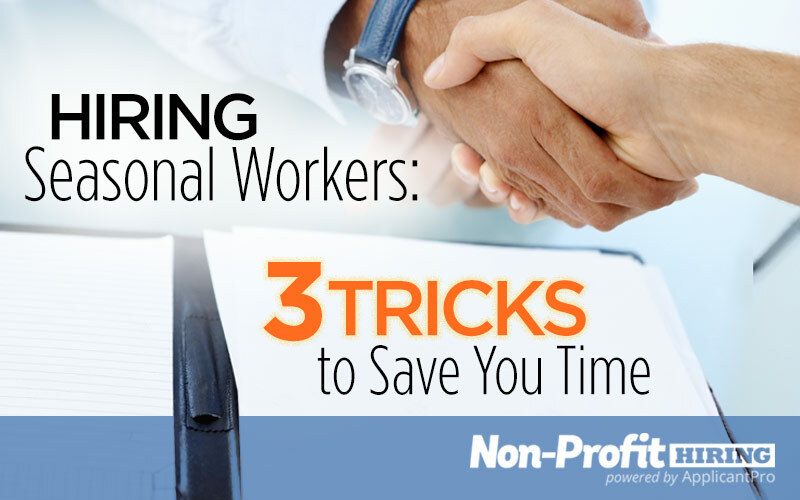 Although a small cash incentive pays off with a good hire, asking for money can be tricky. What about a paid day off, lunch with the boss, the coveted parking spot, or something similar? Would that be enough of an incentive for your employee base? At the end of the season, most HR departments with seasonal hiring are ready to head into the cave for a long winter’s nap. They are so grateful they survived and have months of work waiting for them to get back to. So, they take that season and quickly put it behind them. Don’t make this mistake as well. Before you wrap up the season, take a few minutes to identify your rehirables. It will save you time and money down the road. Yes, seasonal hiring can be a pain but by leveraging your workforce, advertising right, and reaching your rehirables, you will hopefully be able to put more of your limited resources into other areas. Are you ready to get your seasonal hiring in order? , Let’s chat.